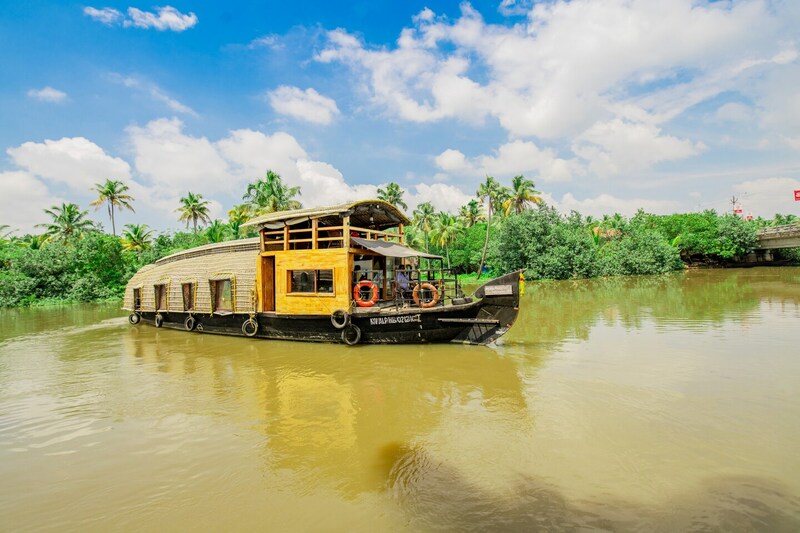 HouseBoat Indraprastham Green House is a beautiful home on a boat in the middle of Kerala's scenic beauty. The yellow painted exterior brings to life this quaint houseboat designed with local, eco-sustainable materials. It even has a top floor sun deck, with a cute hanging lantern, where guests can laze around or try out finishing. Bamboo mats, sticks and wood of the areca nut tree are used for roofing while coir mats and wooden planks have gone into the flooring. The woodwork in the room is stunning. This super comfortable and cosy hotel comes with a dining area. A perfect place for you to enjoy breath-taking views of the virgin landscape.